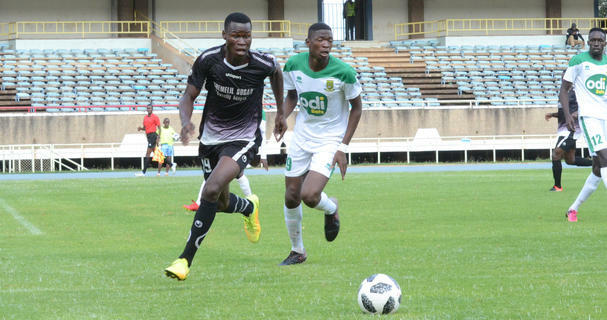 Two goals within the first 13 minutes were enough to see Mathare United beat Chemelil Sugar 2-0 at the Kasarani Stadium and start their new campaign on a high. Cliff Nyakeya and Clifford Alwanga scored but the slum boys had to play the final 13 minutes with 10 men after keeper Job Ochieng was sent off. Coach Francis Kimanzi put out almost the same squad that did duty last season, the only exception being the returning Kevin Kimani who was handed a starting role while defender Andrew Juma stepped in for the injured captain George Owino. Kimanzi’s men had a brilliant start and were in the lead after three minutes when Nyakeya scored from a rebound after Chemelil keeper Bernard Onunga had saved his penalty. Nyakeya had been brought down by the keeper inside the box after racing in and he stepped up to take responsibility. Mathare had a glorious chance to stretch the lead to two four minutes later when Daniel Mwaura went through on goal, but he blew the chance over with only the keeper to beat. But, the second goal came through after 13 minutes when Alwanga leaped highest inside the box to thump a header home off a Kevin Kimani corner. The home side continued to dominate and had another chance in the 17th minute when Nyakeya broke into the box to face the keeper one on one but somehow as well could not hit the ball on target as he sent it flying high. Chemelil had their first effort at goal when Philip Mwangale rifled in a volley from range, but it flew straight to Job Ochieng’s arms. In the 23rd minute, the visitors came close when George Mutimba was teed up at the edge of the box but his curling effort went inches over the bar. Mathare thought they had gone three up after 27 minutes when Johnstone Omurwa swept home from a Nyakeya cross, but the goal was ruled out for offside. Ten minutes later, Mwaura was presented with another glorious opportunity when Roy Okal’s cross from the right found him rushing to the backpost, but his effort from a header was wide. Mathare had brilliant opportunities to bury the game within the opening five minutes of the second half but they were wasteful. Nyakeya forced the Chemelil keeper to a great save from point blank after rushing in to connect a cross from Mwaura. From the resultant corner, Chris Oduor sent his effort against the post after Alwanga’s attempted shot fell in his path. In the 49th minute, Alwanga was sent through on goal by Nyakeya, but his shot with only the keeper to beat went inches wide. Alwanga had another chance at goal in the 70th minute but his glancing header off a Kimani cross was saved by keeper Onunga for a corner. Mathare were reduced to 10 men 12 minutes to time when keeper Ochieng was shown a straight red card for a high boot tackle on Lucas Waitere outside the box. Mathare was forced to sacrifice striker Alwanga for second choice keeper David Okello and from the resultant setpiece by Chemelil, Vincent Mahiga curled the ball just over. Mathare managed to hold on with the visitors not finding much to threaten.